Beervana Buzz: What is the Future of Craft Beer? One of the things people connected to the craft beer industry are reluctant to discuss is the bubble currently forming. By most accounts, the industry is going gang busters. 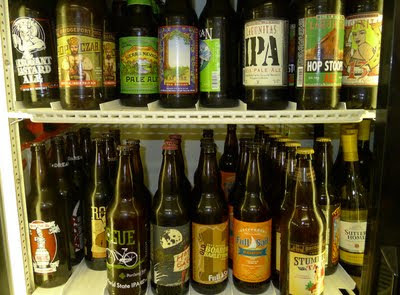 Craft beer sales are up 14 percent for the first half of 2011. The number was 9 percent for the same period in 2010. This is happening in a flat economy at a time when overall beer sales are down slightly, something like 3 percent over the last year. Now take a gander at the graph below. 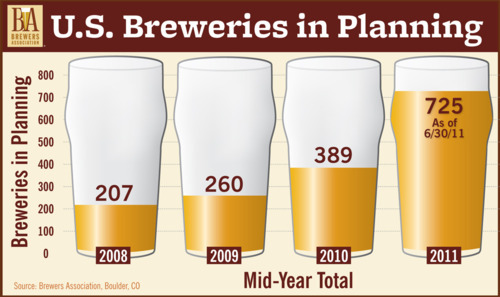 The year-to-year increase in the number of planned breweries was pretty well in-line with the slow but steady industry growth from 2008 to 2010. Not so much for 2011. As of the end of June, there were 1,740 operating breweries in the United States. So the 725 planned breweries represent a 41 percent increase in the number of breweries nationwide. Seriously? A 41 percent increase in breweries to support a 15 percent increase in sales volume? Wow. These numbers admittedly don't tell the full story. All 725 planned breweries won't open this year. The process of opening a brewery and getting up to production speed can be arduous and time consuming. Some of the new breweries will open in 2012 or later. Of course, it's also true that there will be more breweries in planning prior to the end of 2011. So 725 isn't the final count. Is there an elephant in the living room? Indeed there is. Are we looking at an industry that is expanding too fast for its own good? Don't forget that these new breweries are going to have to draw paying customers from somewhere. Some macro-beer drinkers will surely be converted. But not nearly enough to fill the growth hole. The apparent answer is new breweries will draw customers from existing craft brewers. There's something that's been nagging at me for a while. It may be nothing. I keep remembering the story of Joe Kennedy and the 1929 stock market crash. Kennedy sold his holdings prior to the crash after he heard shoeshine boys and other novice business types speculating in stocks. He realized the market was saturated with risk and overvalued. He got out in the nick of time. What does Kennedy's story have to do with craft beer? Maybe nothing. A few years ago, it was hard to find good craft beer at the grocery store. You could search specialty shops to find good beer or you could go to a brewery or pub. Not so today. Walk into almost any Fred Meyer or Safeway and odds are you'll find a decent selection of craft beers from top breweries. That's a great thing. But lately I notice convenience stores have jumped on the bandwagon. The above photo was shot at a convenience store in downtown Portland. That fact that convenience stores are selling craft beer mostly means they are catering to the demands of their customers. However, thinking about the nearly two-fold increase in the number of operating breweries in the near future makes me wonder where those breweries are going to market their product. Is the market saturated? Will increased capacity overtake the size of the current craft market? Is the explosion in the number of breweries sustainable over the next few years. I suspect the answers to these questions will be apparent soon enough. I'll take a look at where the bulk of the new breweries are opening. Parts of the country have been largely missed by the craft beer revolution. If a lot of the new breweries are opening in neglected areas, market saturation may not be an issue.